I’m flying home with my family on a cheap flight which means picking up a connecting flight in Rome. I balls up the time because of a combination of variable time difference between place of departure, place of transit and place of arrival together with shift to British Summer Time while we were abroad. So we miss our flight back to London and it’s the last flight. We end up going into the city for the night as I’ve never been there. My Mrs is frazzled, Enfant Terrible No. 1 is feeling under the weather, so they hit the sack. Meanwhile Enfant Terrible No. 2 and I decide to see what the Eternal City’s got to offer. It’s already past midnight when we head off along the Via Veneto (Fellini’s hang-out). I think of the first famous site of Rome that comes to mind: the Trevi fountain. I don’t even know really what it looks like. I know the name mainly from Holly Johnson’s Love Train. We make our way through the warm night city navigating as best as I can manage with a crappy hotel map, passing various minor fountains along the route. Eventually we come round a corner to see the fountain that matters. There are loads of people hanging out there, all very chilled, bit of a hippy vibe. The air is pleasantly warm. We drink in the atmosphere and absorb the magic of the place at that time. A man offers to take a photo of us both on my camera (above). It’s all an extended moment of magic. I’ve never seen La Dolce Vita at this point. We get back to London and I rent a DVD of Fellini’s masterpiece. I find the movie captivating but that scene truly magical. The design of the audio really strikes me, the not using the sync sound of the fountain. Seemingly this is because Fellini was shouting directions while they were actually shooting. Whatever the reason, it helped create one of cinema’s greatest moments and Anita Ekberg was central to it. That enchantment she created somehow elevated what was already a beautiful experience in my life. That’s what Anita Ekberg did for me and I’m grateful. 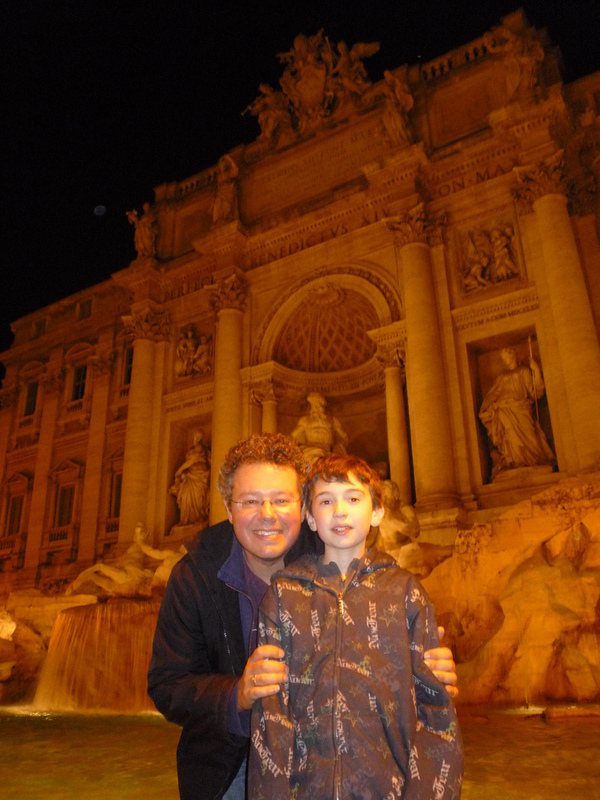 It’s a shared experience I’ll never forget – and nor will my beloved son.